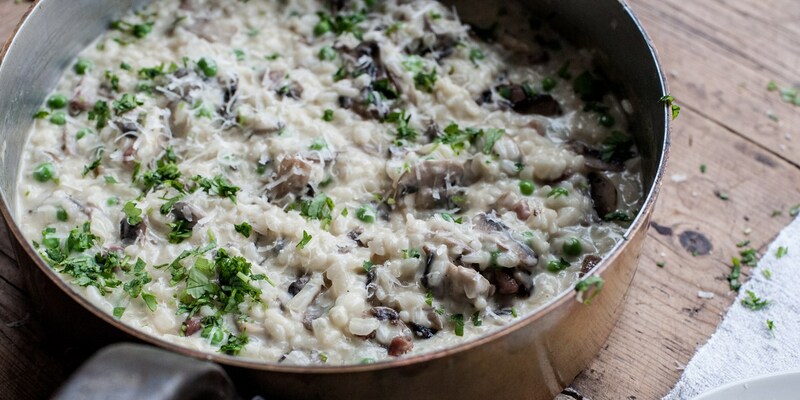 The Italian favourite risotto has a reputation for reducing cooks to a state of anxiety. It’s not surprising why - this supposedly humble dish can go wrong in a variety of ways; too stodgy, over-cooked rice, under-cooked rice or too much liquid are all common downfalls of budding risotto chefs. But don’t be put off - risotto should only take no more 30 minutes to make, so mastering this dish will pay off with a lifetime of quick, tasty midweek meals. The main ingredient of risotto is rice, so it is important to choose the correct one. Arborio, Carnaroli and Vialone Nano are the best for the job, as these can absorb around five times more volume than normal rice and result in a luxurious, creamy texture. Arborio and Carnaroli are the most commonly found varieties, with the latter creating a lighter and looser risotto. A traditional risotto has a loose consistency and should give a little when spooned onto a plate. The other key component of risotto is stock, so use a good, homemade stock if you can. This will improve the flavour of the risotto in bounds, especially if only simple ingredients are used. Once a basic risotto is made, creative flavours can be added to complement the dish. Shaun Hill uses saffron to great effect in his seafood risotto, while Robert Thompson and Andrew MacKenzie use squid ink to create visually striking risotto nero recipes. Galton Blackiston uses heady autumnal flavours of wild mushroom in his classic Risotto Milanese, making a perfect vegetarian main full of earthy flavours. An extra touch of luxury can be added to a mushroom risotto with the addition of truffle oil, like in Paul Heathcote’s recipe. Fresh vegetables such as peas and cherry tomatoes can lighten a risotto, and a little lemon zest makes a huge difference to lifting the flavour. The sweetness of beetroot works perfectly with risotto, and can be complemented with goat’s cheese instead of Parmesan, like Josh Eggleton’s Orange and pink risotto. Don’t waste any leftover risotto, as this can be used to make arancini when cooled. Paul Ainsworth’s Sicilian arancini with arrabiata sauce makes a dreamy summer dish from leftover risotto, so make slightly more than is needed for this tasty snack.